For a price like this one, the overall looks great. I am satisfied, especially the leather quality which I’m finding it excellent. Seems strong but I hope it last longer. As a biker, I would definitely take this jacket for a ride, and I can’t wait what the ladies are going to say about me wearing this piece. It’s every specification holds true as advertised. The black and orange color is bright and looks superb. My girlfriends say I look cool when I wear this. I give five stars to both the seller and the jacket. I enjoy wearing this biker outfit. Thank You, Fan Jackets. I bought this leather jacket for my husband for winter. He likes wearing clothes a bit loose, so I ordered XXL. It came out just perfect. Although he did not like the design much, he was very comfortable in wearing it. Apart from his opinion, I myself like this jacket a lot and love to see him wearing it. I am fond of leather jackets since childhood, and now when I am old enough to ride my motorcycle, this leather Harley jacket has become my partner in doing so. I would recommend this jacket to every bike lover. The zipper is what made me give this Marlboro jacket a 3 Star. When I first opened the package and tried the jacket on, the zipper didn’t move. After some oiling, it started to be free. Its working fine now but I was expecting a biker jacket that is perfect. Superb!! No words to describe this attire. Got a large one for myself and it fits perfect! If bike riding is your passion, then this Harley Davidson and The Marlboro Man Jacket should be your choice to complement your bike. This outerwear’s inspiration was taken from the Harley Davidson and The Marlboro Man movie, which was worn by Mickey Rourke. The imported quality real leather is used for the making of Mickey Rourke Jacket, and it includes Viscose lining for durable ease. The robust quality and patches make it a complete biker Harley leather jacket. Multiple functioning pockets along with the vibrant color make it a dashing outfit. 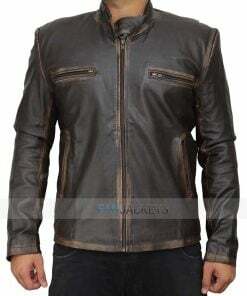 Harley Davidson leather jackets for men should be a choice for bikers to get a fashionable look.